Hawk in my backyard, originally uploaded by TaylorTree. Came home today and noticed this hawk checking out our backyard. My daughter and I couldn't believe how close we got before it flew off. Cool picture, Michael. 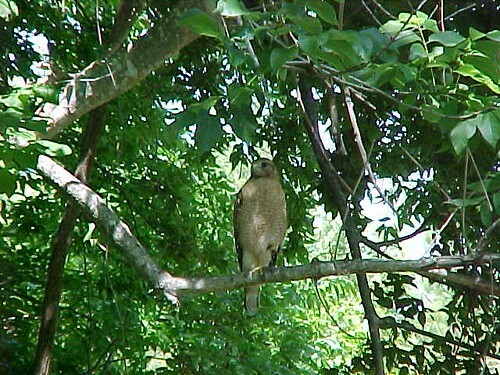 Every year there are a couple of hawks that nest near our home in Chapel Hill, NC. I work from home next to a large window and I'll occasionally see something swooping through the trees. They are impressive birds! I've actually seen one attack a large rabbit. They also make an interesting, easily recognizable sound. Sounds like you've got a sweet home office setup...especially if you get to see hawks from time to time. I agree...very impressive birds.